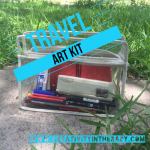 Since July I have been participating in a great online art workshop – 6 Degrees of Creativity. The workshop was developed with Art Therapy Alliance and offers six different art workshops that can be completed at your own pace through December. The workshop was developed as a way to bring people together, no matter where they are in the world, in the shared love of art-making and creativity. Registrants of 6 Degrees of Creativity have access to a social networking site that allows them to join a group for each workshop unit, view instructional videos about art-making techniques, download PDFs of techniques and art prompts, share photos of art-making, and communicate with other participants and instructors. 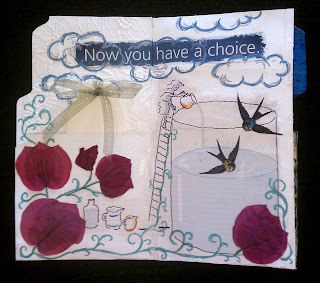 I decided that joining 6 Degrees of Creativity would be a wonderful way to reinvigorate my own art-making. 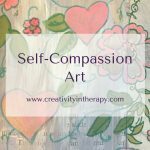 Although I was originally drawn to art therapy because of my love of art, I seldom make time in my daily life for my own art-making. I tend to let challenges and distractions keep me from making time for being creative, often vowing that soon I will do more art. So, now I have joined 6 Degrees of Creativity in order to motivate myself and be inspired by the art-making of others. 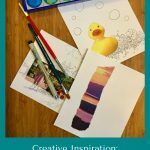 While I cannot sit down everyday to work on my art, I have tried to take at least a few hours every week to begin my first workshop: Gluebook Goodness by Gretchen Miller. 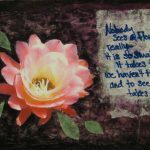 As Gretchen explains, “gluebooks” combine art journaling and collage. 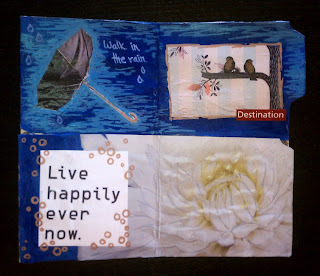 All you need is some kind of book or journal, glue, and materials to collage. One of the techniques Gretchen provides is how to create a book out of manila file folders and then suggests creating a gluebook focusing on one theme. I decided to create a file folder glue book and focus on my upcoming move from California back to my home state of Texas. Working on the project has allowed me to give myself some time for reflection, self-care, and calm in the midst of the chaos of preparing to move. I’ve included in this post some pictures of my gluebook that I have begun so far. 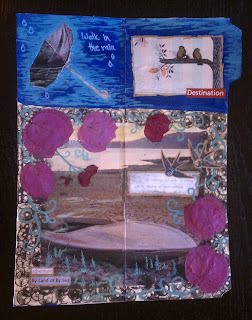 I have used a combination of collage material (magazine images and a map), dried flowers, and paint pens. I have completed most of what I will do until I move (my art supplies will all be packed soon), I but hope to add more sections for the journey and as I start the next chapter of my life in Texas. 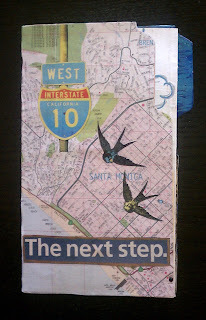 On the cover of my book I pasted part of a map where I have lived in California. On the first page, there is a pocket on the left side, created by folding up the bottom third of the file folder. Inside the pocket, I have placed a stack of cardstock tags I cut out. They are not finished, but I plan to illustrate each one to represent the various cities I have lived in, creating a sort of timeline. So far, my moves have corresponded with different phases of my life–beginning college, going to graduate school, first job, and marriage –and I would like to represent these. On the right side of the page, I cut off the pocket so that I could use the whole area for my collage image. The pink flowers are pressed bougainvillea that grow on my balcony. On the second page, I did not glue the pockets, instead allowing the flap to be folded down for a hidden picture. The inside out umbrella reminds me of a favorite quote: “Some people walk in the rain…others just get wet.” To me it means that when things don’t go as planned, I can make a choice to enjoy the moment and find the good in it anyway. The quote in the fold down section reads: “In walking, just walk. In sitting, just sit. Above all, don’t wobble.” This is a reminder to me to embrace the journey and be present in the moment, instead of wobbling from anxiety and what-ifs. 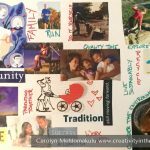 I hope that you will feel inspired to try making a gluebook, start an art journal, or find time for any activity that feeds your creative spirit. 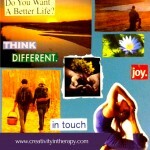 I hope to share more of my projects as I am able to try the other workshops for 6 Degrees of Creativity. Never miss a blog post! Be sure to sign up for the email newsletter. Hi Gretchen. Thanks for checking out my post and thanks for organizing a great workshop!